Yemataw is a social work student at University of Gondar, Ethiopia. He’s a great example of the future potential of our field in this country. Yemataw works with Hope for Tomorrow, an agency that shelter’s homeless children and young people rescued from human trafficking. Children live in a home with up to 15 other children. The agency builds their model around a foster-care type approach. Each home has a mother and father assigned to it. The children are enrolled in school, get regular health care, and care for each other like a family. 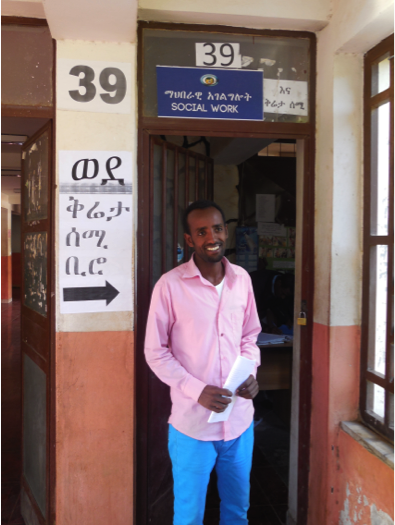 Social work is a relatively new profession in Ethiopia, and its benefit to health and well-being is not well understood here. I’m here with two other members of Ohio State’s College of Social Work to meet with social work colleagues at the University of Gondar. Associate Professor Jacquelyn Meshelemiah, Associate Director of Field Education Elon Simms and I are here during Ohio State’s spring break. As I write this, we are more than halfway through our visit. 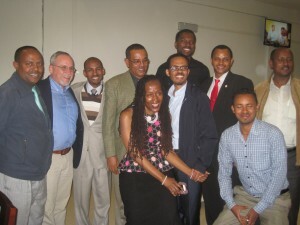 Beginning in the fall of 2104 Gondar will offer only the second Ethiopian graduate program in social work. (Addis Ababa was the first in 2006.) We are assisting them in the implementation of their new MSW program. Our assistance currently takes the form or reviewing curriculum and consulting on field and community education. We anticipate teaching and supporting research here in the future. We began on Monday by meeting the social work faculty. That day was devoted to teaching each other about our programs, and the role of social work. On Tuesday we presented to the collection of social work, nursing, and medical faculty and students. Jacquelyn discussed social work in health care, I presented a conceptual framework for graduate professional education (hopefully more interesting than it sounds), and Elon addressed the role of field practicum and community engagement in social work education. Our presentations were followed by thoughtful and creative conversation. Elon, Yemataw, myself, and Jacquelyn at Hope For Tomorrow. On Wednesday we toured social work agencies and met with both staff and the Gondar social work students who were placed there. That’s where we met Yemataw. We spent much of the rest of the morning at the University of Gondar hospital. In our interviews with physician and nursing staff we learned that social issues are among the most frequent barriers to recovery. Although there is recognition of the high need for the services that social workers provide, there is limited understanding by other professions of the role of the social worker. Asmech is one of just four social workers who cover the entire University Hospital. A similar sized hospital in the U.S. might have 50 or more social workers. Family members are mostly on their own to discover the social work service, as referrals are infrequent. 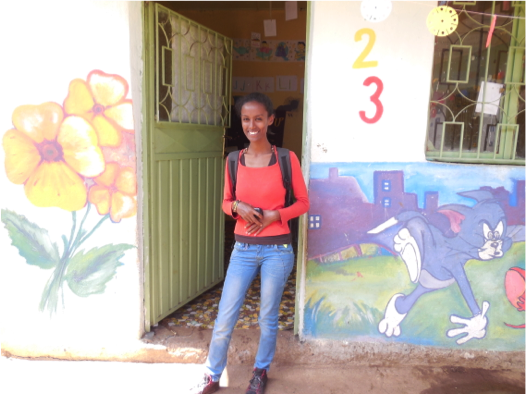 After leaving the hospital we toured another shelter for girls where we met Mahi, another social work student. Mahi works at a childcare program. In Gondar when a woman is imprisoned her children are often placed in the prison with her. This childcare center exists for those children, who are bused to the center from prison each day and returned to their mothers in prison at the end of the day. Today, we’ll meet a student, Eden, who is planning to conduct research on the emotional lives of these children. Mahi, a social work student who works at a child care center. 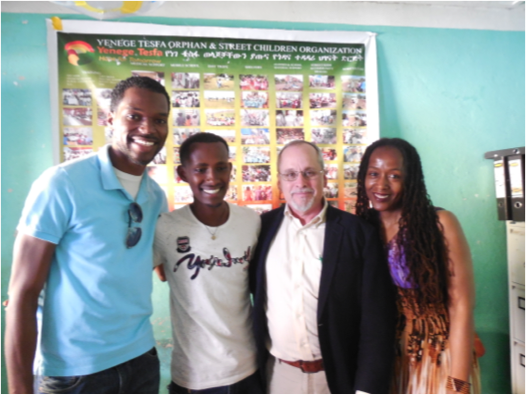 It’s inspiring to meet these students who embody the future of the social work field in Ethiopia. Our evenings have been spent in dinners with our Gondar colleagues. During those gatherings we have learned much about Ethiopian culture, the needs of this country, and most exciting; the great potential of a partnership between the University of Gondar and The Ohio State University College of Social Work. I am inspired by this country and its people and look forward to a long and beneficial partnership. With our partners at the University of Gondar. Posted by omalley.44@osu.edu at 3:23pm Posted in Uncategorized. Bookmark the permalink. I really appreciate the Ohio State University delegation for coming to our university to assess the possible areas of collaboration in the area of social work. I’m impressed with the manner how you pin pointed the advantages of opening and expanding the profession social work in Ethiopia. Social workers has many roles to play in poor but emerging Ethiopia. They can work together with health, legal, and other professionals. I have seen them working impressive work at hospitals, prisons, courts etc. I hope the delegation has visited the works of social workers at Gondar prison. Me, as law lecturer at University of Gondar, has got ample opportunity to know the activities being performed by colleagues at the department of social work. I have also got an opportunity to work together with them since there are common courses like family law. Kelali – Thanks for reading my comments and taking the time to respond. We did learn some about the role of social workers in Gondar prisons, but have a great deal more to learn. I hope a future visit for us includes the opportunity to meet with you, and learn about your perspective on the prison system in Gondar, and the role of social workers. We are really thankful for coming to our university and specifically the whole thing we have had at Social Work department whereby we identified the possible areas of our future collaboration in research, teaching and outreach activities. I am very much impressed with your commitment to work with us which you have expressed it very well by posting this important information on your website. You have expressed it very well. I hope windows of opportunities are open for us to work together, collaborate and the develop and make it flourish the emerging field of social work in Ethiopia. I am confident that we have the resource and the asset to realize this if we work together in collaboration. Thank you for visiting us hoping that we will see you too in the future. We continue to be excited about our opportunities. Once we got home we met with the advisors of our student associations and are planning a joint online meeting of our students and students from Gondar. We are also meeting soon to discuss a return trip to Ethiopia with plans to help teach in the graduate curriculum. Last week I met with a hospital social worker to visit with her about hospital social work in Ethiopia, and the possibility of her helping us with our consultation. So, as you can see, our interest in continuing our new partnership is quite alive. I am very happy for your initiative and commitment to work with our university specially social work department. Fantaye Addis, social work student from University of Gondar. I am very thankful for your collaboration in launching this awaited department in our country,Ethiopia. Indeed its a great opportunity for me to be a social work student at University of Gondar and I wish success and durable interventions and changes for Social work professionals world wide. Nuradin Abdireshid, Social work student @ University of Gondar, Ethiopia.